Combine all ingredients in a mason jar and shake until combined. I should have known not to attempt anything complicated for dinner tonight. I have a terrible head cold, and I've been barely functioning for a few days. But my son is at a sleepover, and I was pretty excited to get into some of the recipes I've been saving for those times. I had no intention of making this one exactly as is, I knew I was going to be swapping out beef broth for chicken broth, yellow mustard for dijon mustard and that I was going to do a combination of sliced and shredded cheese. I had no idea how far this was going to go off the rails. We are big 'breakfast for dinner' fans. Our go-to is usually Belgian waffles, but we've been getting bored with the classic recipe. I found this recipe on the Mother Thyme blog a while back. I've got a stockpile of frozen bananas, perfect for this recipe. I put them in the bowl I'd be using for the wet ingredients, defrosted them in the microwave and then mashed them. For the topping, I pulled another banana out and sliced it while still frozen. I added a 1/4 cup King Arthur Flour mini cinnamon chips to the batter and omitted the nuts. Mini chocolate chips would be great too. A drizzle of real NH maple syrup, the sliced bananas and a few more cinnamon chips made this perfect. I've been a member of the Taste of Home Community for over 13 years. One of the fun posts there is a weekly challenge where an ingredient is given and you are supposed to try a new recipe using it. This week's ingredient is pineapple. I'd pinned this recipe a little while back and the challenge was the perfect reason to bake it up today. I doubled the batter ingredients from the original recipe, I wanted to make sure I had enough to make some mini donuts too. Thank you so much Ashley at Baker By Nature for this fun recipe! Another week, another new chicken recipe. I fear we may sprout feathers soon, but still, I keep finding great new ways to serve it up. I picked up heavy cream and then completely forgot why, so I went in search of recipes that used it in my MasterCook files. I found this recipe from Mother Thyme, and I knew it would be a gamble. Jake doesn't like herbs or sauce. Worst case, I figured I'd hold some of the chicken aside and he could have that. 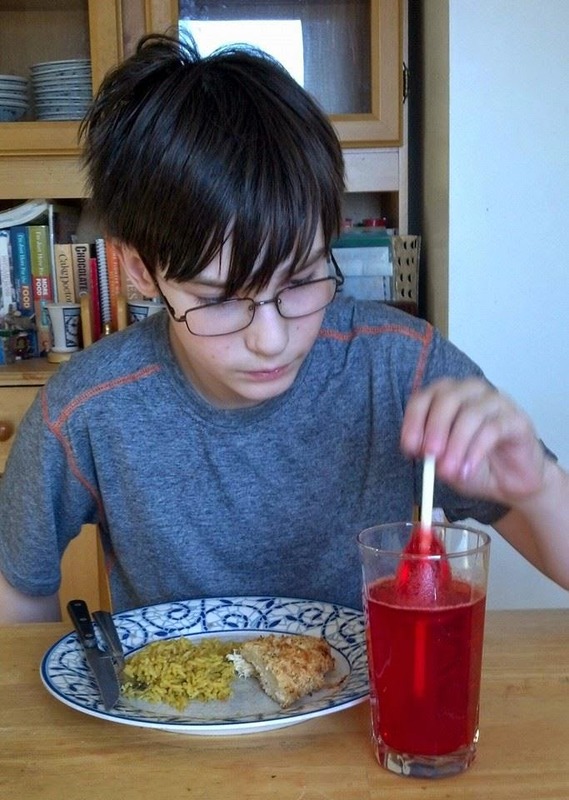 I was shocked when he not only finished his chicken, he asked for more of the sauce to be spooned over his orzo. I increased the sauce ratio slightly to have plenty for the pasta. When it wasn't thickening like I wanted, I removed about a quarter cup, whisked in a heaping teaspoon of cornstarch and added it back to the pan. Perfect! Thanks so much to Jennifer at Mother Thyme for this fantastic recipe! We're eating lots of poultry lately, and I've started hearing the grumbling from my family. With the grill covered with snow and ice again (yay New England! ), my options were a little limited. Staring at the package of chicken tenders in my fridge, I wondered what I could do to them that would be exciting and different. I had a few hot dog rolls and 4 strips of bacon that needed to be used up. Usually I put together a more elaborate prank and get him with it earlier in the day. This year I let him think I forgot, and then we sat down to dinner.